I appreciate getting the opportunity to hang my art in places where it intersects with people’s everyday lives. 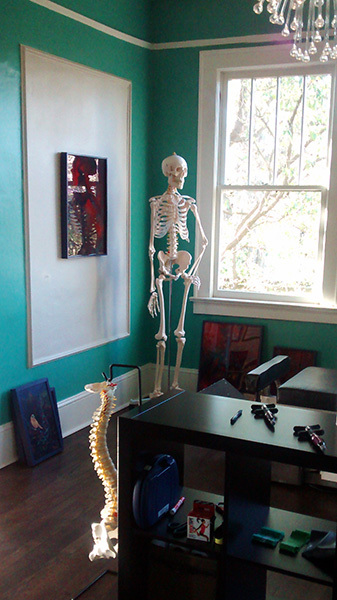 There has been a steady progression of exhibition locations from churches, coffee houses, restaurants, work spaces, libraries and now my first ever Chiropractor’s office. Because why not look at art while getting your back adjusted? I enjoy stumbling across new locations and the potential each has to offer. These are the ordinary places people frequent for reasons other than art gazing; ie. family meals, coffee with friends, errand running or work meetings. I love that kind of collision when someone is just going about their usual day and unexpectedly their attention is captured by a piece of art that may resonate with their heart and mind in a new way. I consider it art that supports real life, decorating the walls of the ordinary while providing a fresh perspective to be carried with on.